This week there was a surprise flowering at the Cambridge University Botanical Gardens. 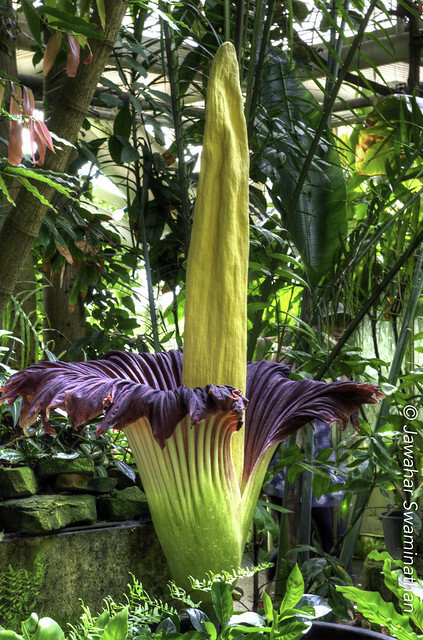 The plant known variously as Titan arum or Corpse flower bloomed after a gap of 11 years. Titan arum (Amorphophallus titanum) are native to Sumatra and are one of the worlds stinkiest and largest flowers described as rotting meat, moth balls, old socks etc. Thankfully the worst of the smells are in the night time and I conveniently missed it! The photograph above is a HDR of 3 bracketed shots at -2, 0 and +2 stops. Shot with a 35mm f/1.8 Nikon lens on a Nikon D7000. Processed in Photomatix Pro. Posted on July 21, 2015 Categories Cambridge, HDR, Nature, PhotographyTags cambridge university botanical gardens, corpse flower, exotic plants, flowers, HDR, hdr photography, Photomatix Pro, plants, rare flowers, titan arumLeave a comment on Once in a generation!